Every crafter has a stash of something. I have a huge stash of scrapbooking paper, even though it’s been a while since I’ve scrapbooked. That paper has really come in handy for some of Lily’s school projects! I just started sewing a few months ago, and I was surprised to discover that yes, I do have a fabric stash! These strips of fabric are left over from the dance bags I made for the girls, from the Christmas presents I made for my family, and from the baby quilt my mom made Emmy. I just love all the colors and patterns! They are just perfect for the new scrappy quilt blocks I learned how to make. 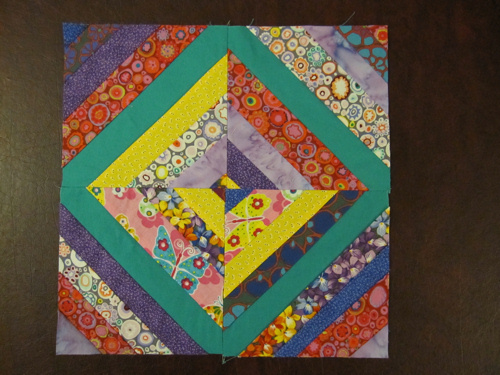 It is amazing to me that random strips of fabric can come together to make such a beautiful block. I chose strips using colors that I felt went together, but tried to vary their placement. 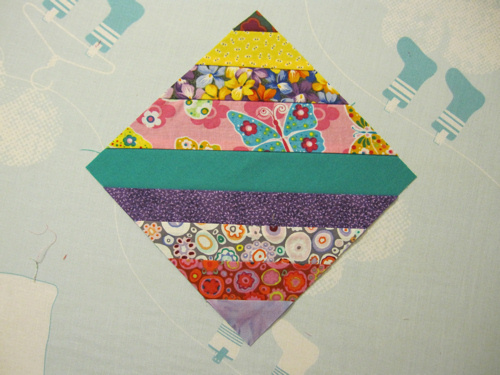 At first, this quilt block doesn’t look like much; it appears to be pretty sloppy, in fact. Once those strips of fabric are trimmed, however, you can start to see this square’s potential. 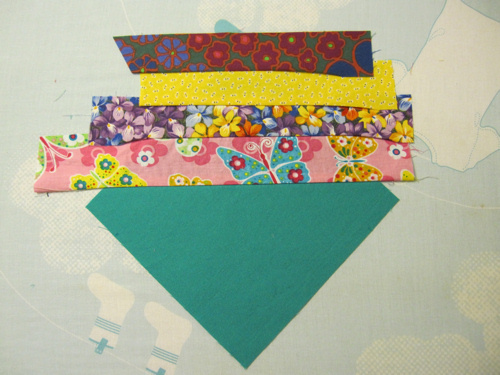 Even though I am following a pattern and using exact measurements, making a quilt square is so creative. 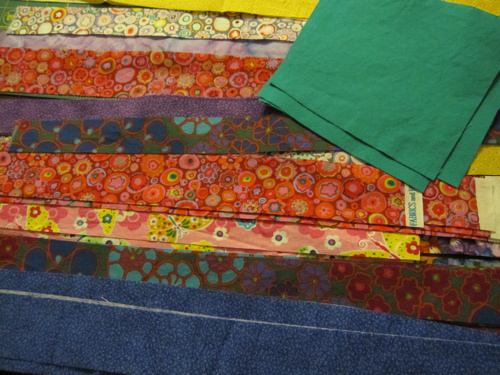 Choosing the fabrics and arranging them in various ways is almost like a puzzle. Different arrangements have different looks. 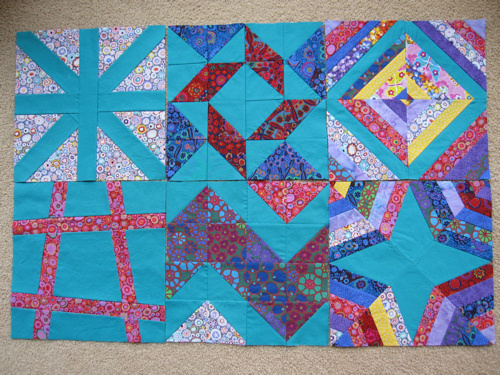 After playing around with the location of the four squares, I eventually decided which look I liked the most and sewed them together, making one large quilt square. And my string quilt block is finished! So fun to make! Using a similar method, I also made a broken spider web block, which is on the bottom right of the picture below. 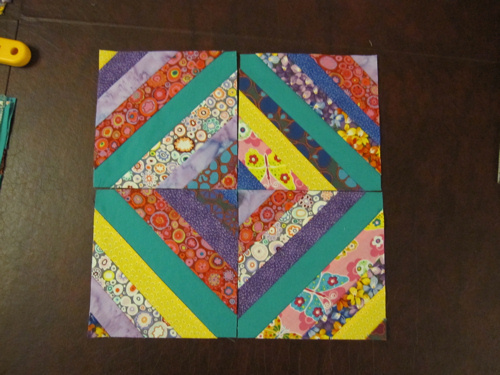 I’ve completed six quilt blocks! By the end of the year, I should have a completed quilt. As I was working on my blocks, I realized how much fun my mom must have had making quilts. Quilting was one of her passions. 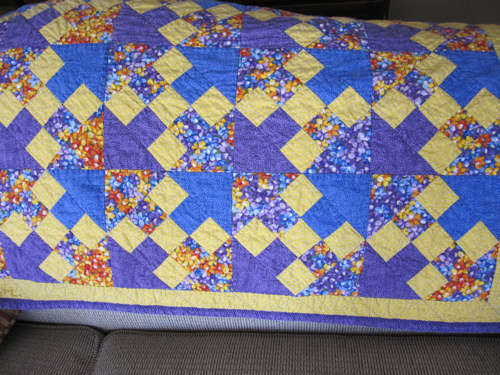 After her death, I had many people tell me how much they loved the quilts she made for them. She loved to make crib quilts for new babies! One of the last quilts she made was Emmy’s quilt. She used a lot of yellow, which was unusually bright! Mom generally didn’t like yellow, but we had painted Emmy’s room yellow. Ed and I didn’t find out whether we were having a boy or girl, and that was a challenge to Mom’s quilt-making as well. Emmy calls this “Grandma’s Quilt”. I’m so glad she has this memory of her grandma! 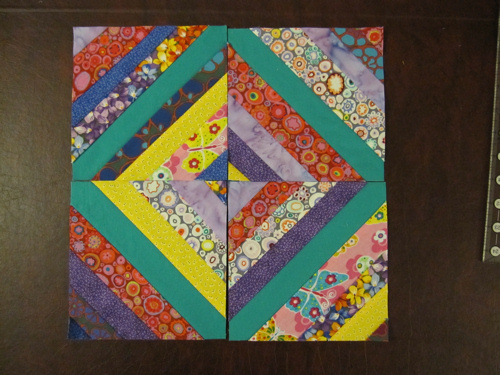 7 Responses to Six Quilt Blocks Done! Way to go. It looks like it will be a beautiful quilt! That looks so good! High five for quilting! That's one project I've always been intimidated by! I just started sewing last year. It's a lot of fun! Oh, I think those count as quilts! And what a great way to use old clothes! I'd like to make a quilt out of some of my old T-shirts that I used to wear.